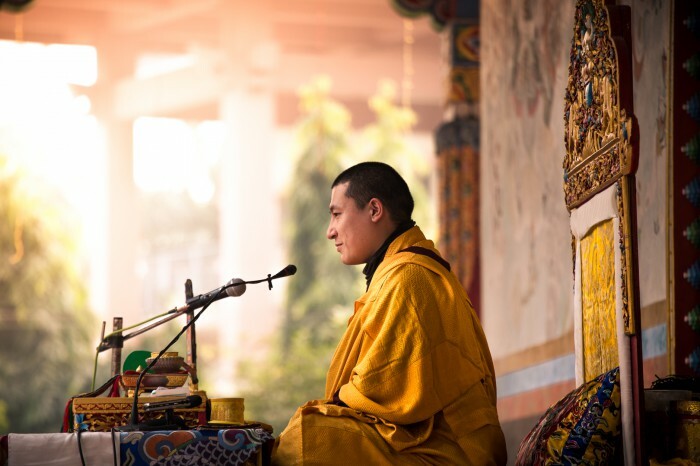 Thaye Dorje, His Holiness the 17th Gyalwa Karmapa, is dedicating the upcoming Tibetan New Year (Losar) commemorations to His Holiness Kunzig Shamar Rinpoche, who passed away last year. The Karmapa International Buddhist Institute (KIBI) in New Delhi, India, will host the event on 19 February. Buddhist ceremonies will be performed for favourable conditions for the New Year. In the afternoon, visitors to KIBI will offer the traditional white scarves to Karmapa and request blessings for the New Year. Karmapa will also guide a Chenresig meditation. Participants will also sing the auspicious song “Calling the Guru From Afar” and recite the Prayer for the Swift Rebirth of Shamar Rinpoche. To conclude, there will be an offering of a thousand lamps, with the wish for the wellbeing and prosperity of all for the coming year, and especially with the wish for the swift return of Shamar Rinpoche. During the coming Female Wood Sheep Year I would like to ask all of my students to join me in the recitation of the prayer for His Holiness Shamar Rinpoche’s swift return.